by Emily Russ. Written on 2016-04-03. Published in 2017 Issue 1. A barren stage, four strange chandeliers, and nine apples set the scene for Tim McDonough’s production of As You Like It. Set in Nevada’s Black Rock Desert during the Burning Man festival, this modern interpretation of Shakespeare’s comedy provided an interesting contrast for its all-male cast. Hearkening back to the Elizabethan playhouses, the stage itself was a thrust built inside a black box theater, allowing the actors to engage with the audience to a certain degree. Two ladders towards the back of the stage with a scrim above created a smaller space within the stage, used as both a wrestling cage in the first act and as the entry point for Hymen at the end of the second act. Psychedelic designs were projected onto the scrim at the end of the production, adding to the Burning Man setting. The chandeliers, grotesquely industrial in the court, blossomed into upside down trees in Act 2, providing shade and life in the Black Rock Desert. The minimalism of the set allowed the audience to focus on both the actors' words and their physicality. This production focused on the relationship between Rosalind and Orlando, the different forms that love can take, and the danger presented at both the court and in the Forest of Arden. A relatively somber production, it also focused more on the heaviness of the material, rather than the comedy of Shakespeare’s language. Max McCreary’s Rosalind was headstrong and emotional, vying dangerously with the cold authority of her uncle, Duke Frederick, played by David de Vries. Constantly toying with his wig, the only costume piece that hinted at womanhood, McCreary demonstrated an exceptional talent for portraying a female romantic lead that was matched by Alexander Fellows's characterization of Celia, Rosalind's cousin. Fellows was quite a bit taller than McCreary, further adding to the comedy when Rosalind asked, "Were it not better because I am more than common tall, that I did suit me all points like a man[?]" The male casting of female roles allowed for further humor when Touchstone, the clown, played by Josh Oberlander, demanded that Rosalind and Celia “swear by [their] beards,” to which Celia replied, "By our beards, if we had them." This, coupled with a sly, somewhat embarrassed look to the audience from Fellows, had the audience in stitches. Fellows's quick-witted and humorous Celia was the perfect balance to McCreary’s wistful and lovesick Rosalind, prodding her cousin with good-natured jabs, but also scornfully reminding her of who and what she is, threatening to "have [Rosalind’s] doublet and hose plucked over [her] head and how the world what the bird had down to her own nest." Cameron Frostbaum’s Orlando was about as love-struck as anyone could be. Orlando did not hold back with his declarations of love, often climbing the upstage ladders in order to proclaim his undying devotion to Rosalind. His noble and chivalrous bearing was all the more emphasized by the deplorable behavior of his brother, Oliver, played by Adam Friedman. Orlando’s selflessness and courage was only strengthened by Friedman’s interpretation of Oliver as a sleazy, corrupt older brother. Oliver’s romance with Celia provided a hilarious contrast to Rosalind and Orlando’s: lustful and ridiculous as opposed to romantic and serious. The most ridiculous relationship of all, however, was that of Oberlander’s Touchstone and Nicholas Surbey's Audrey. Dressed in obnoxiously colorful clothing, Oberlander spent much of the play making fun of Rosalind with Celia and then complaining to Adam, played by Allan Edwards, about the Forest of Arden and how terrible it was compared to the court. The sarcastic, spoiled interpretation of Touchstone contrasted beautifully with the independence of McCreary’s Rosalind and the fortitude of Fellows’s Celia. Out of the four female characters played by men, Surbey was by far the most convincing. His small size and the length of his natural hair contributed to this illusion, but his mannerisms and physical movements were what really brought the character to life as a woman, not as a man playing a woman. Despite being physically dragged around the stage by Touchstone, Oberlander’s Audrey maintained an air of disdain for the clown, even after agreeing to marry him. Flirting with William in order to make Touchstone jealous in Act 5, scene 1 served to shift the power dynamic of the couple dramatically in Audrey’s favor, giving her the upper hand in the relationship in spite of being dominated by the physical actions of Touchstone. The use of technology throughout the play was intriguing, to say the least. The two instances of cellphone use differed greatly in their effectiveness. The first, when Oliver asked if "Charles, the duke’s wrestler, [was] here to speak with [him]," was off-putting and strange. Speaking into a cellphone instead of dialogue with another actor was an interesting choice on McDonough’s behalf, but not one that necessarily worked well. However, when Rosalind announced "Well, this is the Forest of Arden" and Touchstone whipped out his iPhone to take a selfie with the girls, it was met with uproarious laughter from the audience. This time, the phone was used to show the age of the characters and provide comic relief. It was not used to replace a character, and the actors did not interact with it as if it were another person. The tumultuous finale, marked by the appearance of the Atlantan experimental musician, Klimchak, as Hymen, was as bright and colorful as the production itself. 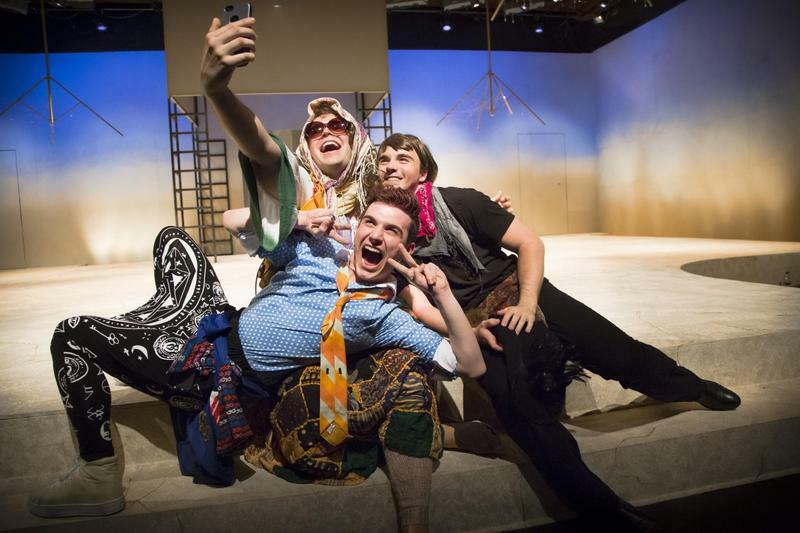 The use of glow-sticks during the marriage ceremonies reminded the audience of the Burning Man setting, and McCreary’s direct, humorous delivery of the epilogue brought about a fitting end to Tim McDonough’s production of As You Like It.